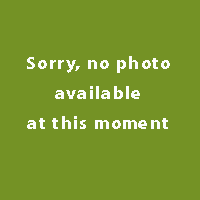 Bright orange early summer flowers with yellow centres and deeply divided mid green leaves. 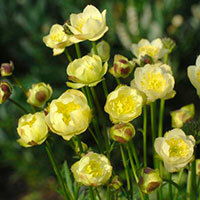 These cheery, buttercup-like flowers are perfect for the middle of a moist border or for planting at the margins of a pond or stream. To prevent the roots from drying out apply a thick mulch layer around the base of the plant in early spring. Little used and ‘ unknown makes unpopular ‘ is certainly applicable to this fixed plant. 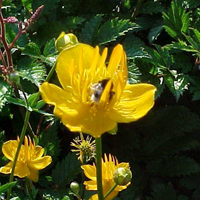 Wrongly, because the bright yellow colored and bulbous flowers of the bullet flower (Trollius) fit perfectly on the edge of the marsh area near the pond. Pale yellow, tissue-like petals fashion an exquisite, nearly double, shallow open cup. The sumptuous blooms pose above an attractive mound of shiny foliage carved into small sections. 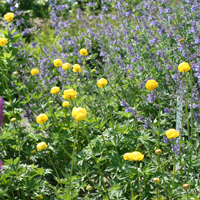 Globeflowers are extremely popular perennials, bursting into colour in late spring and early summer. 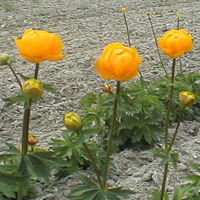 This selection has large double flowers in a glowing golden-orange shade. Sometimes called Buttercups, these grow well in a sunny or part-shaded border, also at the edge of a moist woodland. Flowers will last a few days when cut.